Gives a “wet-look” shine. 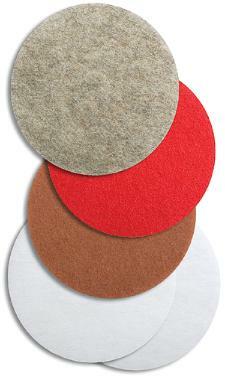 Our floor cleaning pads are made with a blend of natural fiber and polyester. This blend uses properties of both fibers to create the most unique and respected floor pads in the world. A light abrasive floor pad for spray buffing to a satin gloss. The fibers are more open to help keep the pad from glazing over. A mildly abrasive dry buffing floor pad for slow speed floor machines. The Tan-Buff pad will buff away light soil and level scratches for a soft luster. A non- abrasive dry polishing floor pad for slow speed floor machines. The White-Polish pad will level scratches for a high luster. A very soft non- abrasive dry polishing floor pad for slow speed floor machines. This pad will polish to a high luster.